This year (2013) marks the 30th holiday season that I’ve given thanks for Certainly Wood, a business that rose up almost out of nowhere in 1983 and has taken me along on its journey ever since. The story actually begins about 8 years earlier than that in Buffalo, NY when a veneer mill representative named Lee Jacobs recognized and rewarded my love of beautiful wood and my thirst for woodworking knowledge. He hired me to sell smaller portions of veneer and lumber to wood department students enrolled at nearby colleges. Our small and simple ad in the very early issues of Fine Woodworking magazine brought us enough out-of-state customers to prove that a mail-order veneer business model could work on a national scale. Our box of index cards slowly grew full of customer names, and the shelves filled up with veneer. Veneer crates entered The Wood Shed, as it became known, through a basement window and left in UPS boxes through a fire door. After 7½ years of learning, managing, building relationships, and shortly after it changed ownership, The Wood Shed and I parted ways. The friendship and loyalty of customers and veneer mill owners followed me when I left. That was going to change my life. 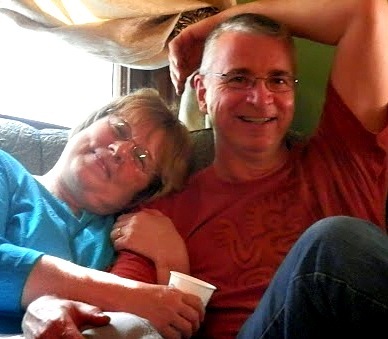 My wife Roz and I had just bought and moved into an abandoned “fixer-upper” home with our three children. 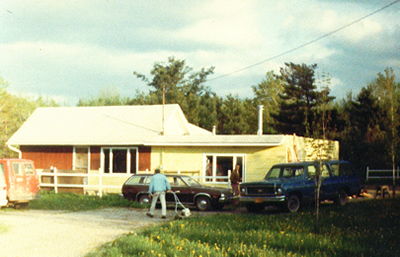 The end of 1982 finds us in that simple house with goats, some rabbits and a few garage sale stationary power tools for working with wood. We were a happy family without any savings just getting by month to month. No one would have considered our financial position to be the right time or our home to be the right place to launch Certainly Wood. That finally brings us to 1983. Some of The Wood Shed’s customers tracked me down and asked me to source veneers for them. At the same time, a few veneer mills also tracked me down to ask me if I would consider selling their veneers as I had before. The supplier’s solutions to my poor financial position were to give me rather large lines of credit with very long payment terms and to place additional wood on consignment with me. Roz convinced me at this point to abandon my ambition of being a custom woodworker and urged me to concentrate work time on my abilities that people already appreciated. As the momentum picked up, one veneer importer decided to place over 350,000 square feet of veneer on consignment with me. The consigned inventory, mostly exotics and burls, was spread out evenly over 30 different species. Up to that time, veneer was stored wherever I found space. My garage rafters were full, behind the couch and under the bed were full, my mother’s garage was full and even my next door neighbor’s basement shelves were full. Veneer kept arriving. A friend and local lumber yard owner gave me the solution: an entire building and a fork lift, rent free, for as long as the business needed to incubate. We moved in. A few trips to the telephone book room at the local county library yielded the addresses of about 60 known veneer users located in various U.S. cities. I described the veneers that I had accumulated in a “Wood Menu,” mailed it to the 60 prospective customers, placed a small display ad in Fine Woodworking magazine, and hoped and prayed. The orders that trickled in were shipped out in food and department store boxes gleaned from dumpsters and turned inside out. In 1985, we moved into an old basket factory where we had room to slowly expand for the next 13 years. There was steady and deliberate growth during those years. We learned and evolved as we went along, eventually earning the loyalty of hundreds, and then thousands, of veneer users. 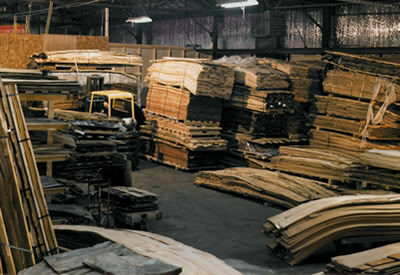 In 1998, we designed and built a much larger and very efficient veneer distribution center. We’re still in that building. It’s located two miles from the living room where Certainly Wood began and where Roz and I still live. 1989: Greg (middle) joins Adam (right) and me. Eventually profits, taxes, employees, vacations, health insurance and more all came about. Like every journey, ours had a few sad moments and struggles. Our first employee, Adam Bishop, passed away in 2001 after 14 years with us. Still, every year we grew. 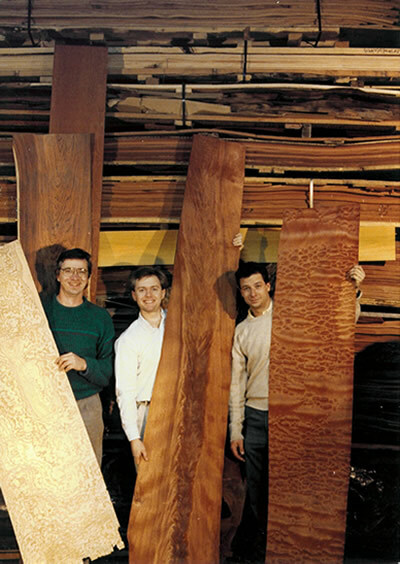 Much of the credit for the constant progress is due to the hard work, dedication, good ideas and growth of the talented team that has assembled around Roz and I. Greg Engle showed up in January 1989 and has since become synonymous with Certainly Wood. Jim Carroll originally worked with me at The Wood Shed before joining Certainly Wood in December 1996. His son Dan worked part-time for a few years before becoming a full-time salesperson in 2002. Danielle has managed the office team since March 2000. The sales and office support teammates are also solid contributors and are no less critical to our success. Roz and I are extremely grateful to all of them. It’s not an easy task to meet or exceed the expectations of dozens of veneer users every day. Now, as I incrementally step into retirement, I foresee Certainly Wood guided by their leadership, more qualified than my own. In this short story, and in the few dozen stories between the lines, there was always a common thread: grace. Grace is defined as undeserved favor. There were a lot of people who favored us, shouldered risk with us, equipped us, worked alongside us and encouraged us by making our success their own objective. By grace, the results of our endeavors almost always exceeded my expectations. Thirty years is a very long time for a business to exist, yet, by grace, Certainly Wood still looks and acts like it’s in the prime of its youth. For the rest of the world, the end of 1983 marked the quiet appearances of some pretty remarkable things: compact discs first appeared on store shelves and began replacing vinyl records; Michael Jackson’s Thriller changes the music/video industry; MRI diagnostic machines were first introduced in Britain; and the FCC authorized Motorola to begin testing the very first cellular phone service in Chicago. For me, 1983 marked Certainly Wood’s quiet appearance in an unlikely place at an unlikely time. I feel humbled and grateful. This coming year and beyond, enjoy giving thanks and spreading grace.